DJ Delorie was looking for an excuse to learn about Verilog and CPLDs. 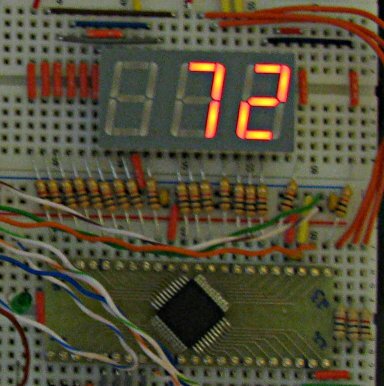 So he coded up this binary to 7-segment display converter. He provides links to the source code and says this project fits into the Xilinx XC9572 (the same chip used in our Coolrunner-II CPLD breakout board. You can get our XC9572XL dev-board for $15. This entry was posted on Sunday, April 1st, 2012 at 3:00 pm	and is filed under code, CPLD, LEDs, open source. You can follow any responses to this entry through the RSS 2.0 feed. You can skip to the end and leave a response. Pinging is currently not allowed. Whew! Just in time. We’re safe if they decide to discontinue the 7447. This appears to be four years old looking at the dates on the code. Not that take matters if you’ve not seen it before of course. I’m tempted to make something like this just to learn, my previous led flashing cpld board just isn’t very interesting.